In May of 2013, students from West Virginia University Honors College traveled to Santarem, Brazil with Amizade Global Service-Learning. While in Brazil the students learned about the challenges of providing health care in the Amazon region and even spent 5 days on a river boat visiting and serving Quilombo river communities. Thank you Nikul, Cameron and Kartik for sharing your experience with us! Check out Part 1 of their experience here! A big development in discovering how to communicate effectively with the Brazilians was working with the nurses in the clinics, especially in pediatrics and gynecology. The pediatric nurse spoke English relatively well and explained prescription writing and diagnoses well in English. The nurse in gynecology was also very helpful with learning to converse and although she did not speak English, she had a way of communicating so that we could understand her. These two nurses not only assisted us in communication, they also helped us understand medical practices by allowing us to write prescriptions, view pap smears, and analyze lab results. 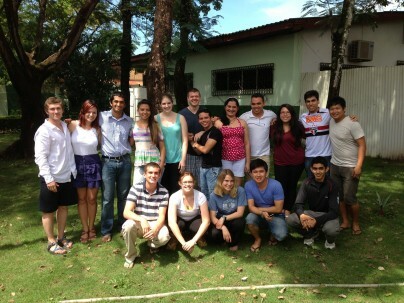 By the end of the boat ride, we had become close with the Brazilian nurses and nursing students. 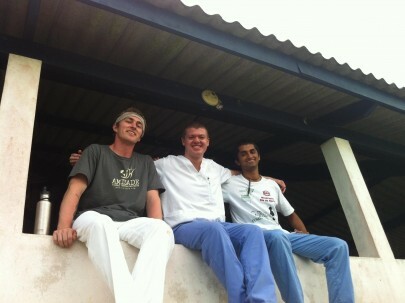 We had inside jokes with them and we hung out with them numerous times in Santarem. We went to the pool making trains down the slides, played cards where the nursing students had to speak English and we spoke Portuguese, hiked in the Amazon rainforest, and ate pizza with them. We were incredibly out dressed at the pizza dinner and were slightly embarrassed by the formal dresses. The nursing students also invited us to attend a nursing class about malaria with them. The class was taught by the pediatric nurse from the Projeto Quilombo, and discussed malaria and treatment for the disease. The class was actually quite easy to understand (from the parts we could read from the PowerPoint) and a great learning experience about malaria and how classes are run in other countries. 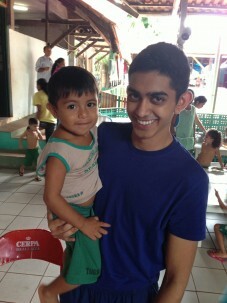 Another part of our trip involved volunteering at a child daycare facility called Seara. A little background to Seara: the daycare accepted malnourished children and for a month provided schooling, healthcare, and nourishment for the children. This of course included monitoring the children’s progress throughout the month and teaching the children about eating well balanced meals. For two of the days we volunteered here and helped the staff out with keeping the children calm during their lessons, free time when they were able to run around the room, bathing, and mealtime. It was a great experience and the children were really enjoyable to work with. Some of us were able to see, as we returned, the relief of the caregivers we were helping out as they saw we were helping them for a second day. Even though we may not have been much help with understanding the children, we seemed to be a big help keeping them calm when they needed to be, and the children seemed to enjoy when we were able to play with them when they had free time. For the most part the children were very well behaved and when you told them to do something the first time they would listen to you, or at least pretend. While the trip went smoothly for the most part, there were certain things that we encountered that were difficult to adjust to initially. These might be points to prepare for on a future trip. From the cold showers to the very obvious lack of variety in cuisine, the local customs and practices of Brasil had a negative effect on some of the participants of our program. We had been warned about culture shock before we came to Brasil by our site director, and he was definitely correct. It is important to mentally prepare for the trip by opening one’s mind for the possibility of anything. A global service-learning project such as this one can force experiences of unease and unfamiliarity, such as cramped conditions, further dietary restrictions, and the unavailability of normal comforts. To say the least, the reality of the experience is undeniable, and preparation isn’t overwhelmingly difficult but it is vital to thoroughly enjoying everything that Brasil has to offer. Towards the end of the trip it was interesting to see how this study abroad trip began to seem less about the honors credits we were receiving from the trip and more about the program title we were in, Amizade. As we continued to see throughout the trip, the night we played soccer with some medical students, we started to truly understand the meaning of the Amizade Global Service-Learning trip. We found out at the beginning of the trip that Amizade meant friendship; however, it took a while to truly understand the impact this word could have on us. Through our several interactions with the medical students we were with both on and off the boat, we were able to see that it does not matter if you speak the same language or not, or even understand each other 100% of the time. What does matter is the ability to bond with our peers as we came together and helped people throughout Projeto Quilombo, which is what really matters. Contrary to our initial belief, the Quilombo people had no problem with our presence and aside from the few stares we got from the younger children because we weren’t Brasilian, everyone else treated us just like the nurses and nursing students. In several instances the people being treated for the various sicknesses and check-ups that they were receiving looked us in the eye and talked to as we were able to understand them talking and not just like simple onlookers who needed help with translation. Following the boat cruise we were able to bond more with our new friends which included having a fine pizza dinner with them as well as spending time exploring the city, teaching them how to play a card game, sitting in on a class on malaria alongside the nursing students, going to a beach community with a nonexistent beach and submerged huts due to flooding of the Amazon River, and other social events. It was interesting that towards the end of the trip we started to be able to understand our friends more easily and it stopped talking a long time to get our point across (along with the fact that we had translators on our phones). As our trip came to a close and we were able to reflect on the experience as a whole, we’re able to look upon the several different activities in which we participated, including the community service in Projecto Quilombo and the Seara child center. We were able to begin thinking about at the amazing opportunities we had, not only to be of service to different communities throughout Santarem, but also the lifelong friends we were able to make in just two short weeks. Now that we are home, several of us are trying to maintain contact with our friends back in Brasil as well as the friendships we made with each other on the trip. It is sometimes difficult to communicate back and forth with our new friends. Oftentimes, we have to rely on a translator to communicate because although our language skills are increasing we are not capable of carrying complex conversations in Portuguese without some assistance. Despite the difficulties in communication, we are trying very hard to, as Jorginho said, “manter contato” or maintain contact, We are trying even more to make possible a return trip to Santarem, Brasil in the near future, where we will not only get a chance to see our friends again, but hopefully be able to serve the community as we did this past month. The trip to Brasil was one that will never be forgotten and the lessons learned and experiences encountered will resonate with all of us for years to come.